Last week a good friend and fellow photographer, Miguel Cortes messaged me asking if I was available to help out on a photoshoot concept he'd been working on, so naturally, when I heard the words "Neon" "Eighties" and "Custom Bikes", well, I was in hook line and sinker! Calling in Liz Gopwani and Tiffannie Michelle to Style our models (Samantha Vitone and Angelica Acevedo, we set off to the Downtown Container Park in Las Vegas to be the background of our shot. Once the awesome tricked out bikes arrived on set we started the setup. Consisting of my Profoto B2 Light kit on some Savage Universal Drop Stands with 46" Photek Softlighters, we set the camera to Rear Curtain Sync (for shutter drag), and started spraying some Atmosphere Aerosol to add a little ambience to the shot. I started spreading the atmosphere aerosol for Miguel to get his shots while we drew a fairly large crowd around the entrance to the park. After he got the images he wanted, we switched off so that I could fire a few frames before moving to our second location for the alternate look, (And subsequently, more complicated shot). By the time we got ready to roll for this setup, Miguel had to leave. Meaning, I had to take the lead to finish the image. 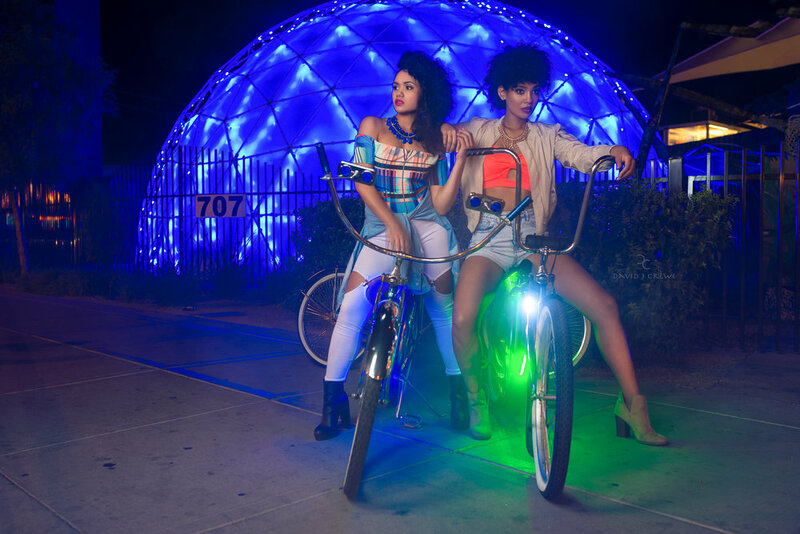 The plan was to setup the bikes in an alley using rear curtain sync with my Sigma 35mm A series locked on a tripod with focus dialed into a "zone" for the girls to roll up on and hold a pose before the lights fired off. It took several test shots and countdown tries between the fog and approximate "marks" to hit before we finally nailed our "fire" shot, but with an awesome team, we managed to get the images we wanted all in under an hour's time!